Earlier this week, Google's new social networking project, Google+, launched in a limited public beta. With the intention of making it easier for users to share content on the web, Google has made a small number of Google+ features available to testers. As expected, the main focus is a stream of content shared by people you have added to your network. Posts are ordered in terms of recent activity, so if someone makes a new comment on a post you made last Tuesday, it'll go to the top of the stream. This is handy, yet it could lead to newer posts without replies simply getting buried and going entirely unnoticed. Google+ is built around Circles, which are lists of contacts. You can choose to share content with specific people, one or more of your circles, or just make it totally public. A lot of praise has been heaped upon this feature, yet many have overlooked the fact that customisable friend lists have been a part of Facebook for a good few years. Nevertheless, the transparency of privacy controls that the Circles concept perpetuates is likely to garner a lot of support for Google+. Instead of being able to "Like" posts, you can "+1" them. This feature is available for content on both Google+ and other websites. While Google's interesting grammatical choices may upset some people, the feature in its current form is hardly groundbreaking. As well as this, the search giant has managed to incorporate a glorified search engine into Google+, Sparks, which allows users to look for things they are interested in and returns a chronologically ordered collection of results. One of the more novel features is the ability to create a Hangout. This is Google's term for video conference calling, which can be limited to specific Circles. Multiple people can participate in a video call, a clear advantage over Skype, which only provides one-to-one video chat for free. Text-based conversations via Google Chat are integrated into the Hangout. Text chat is also available on its own, but is nowhere near as exciting. 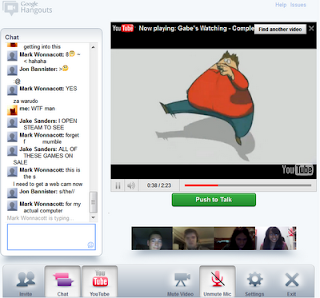 In addition, Youtube integration allowing users to select a video to be played to everyone in the hangout has been implemented. On the surface, this may seem somewhat frivolous, yet it adds a more natural dimension to conversations and really does make it seem like you're just hanging out with your friends, despite not being in the same geographical location. While testing out a Hangout, we did experience a few technical issues, but even those with slower Internet connections were able to participate without too much disruption. Refinements such as allowing a queue of videos to be made and providing an option for voice to be transmitted continuously while watching videos ought to be put into place, but there is still a strong case for people moving over to Google+ simply for the group video chat. At this stage, it is difficult to say whether or not Google has a chance of overtaking its rivals in the social networking market; Google+ currently lacks a number of features and it is not clear if these will be accounted for in later releases. For a beta, this is a compelling service and the potential for integration with other Google services will probably give Google an edge over the competition. Try it out, if you have a Google account.